There was almost a sing in the demand and certainly spryness as Ralph Anderson with beard, flopping straw hat and bibbed overalls provided verbal accompaniment to driving lines as maneuvering his near-four-ton draft horse team. Several dozen people, which grew to a crowd of about a 100 as the day lengthened, had come to watch the Old-Fashioned Corn Harvest hosted as part of the Ag Heritage Park activities during Old Settlers Day at Alta Vista. Kirby and Calvin Zimmerman, and Matt Easton, directors of the Ag Heritage Park, event coordinators-sponsors, were assisting with demonstrations in the Wabaunsee County corn field of Glen Swartz, Alta Vista farmer-stockman, who has also generously provided his cropland for similar demonstrations in the past. “It’s a slower harvest than when I pull the combine into the field, but the corn still gets in the bin at the elevator, and that’s what counts,” commented Swartz, readily lifting a hand to assist, offering freewill advice, or explaining to an unknowing bystander what was taking place. Ralph Anderson, 75, Council Grove, talks to his full blood Belgian mares Minnie and Molly as he prepares to assist with an Old-Fashioned Corn Harvest demonstration hosted by Ag Heritage Park during Alta Vista’s recent Old Settlers Day. Bruce Anderson, 49, Americus farmer, horseman in his own right and son of the guiding teamster, had a curved husking peg hook strapped to the palm of his hand to demonstrate the way many farmers harvested their corn crop a century ago. “Bruce walked down each row, picking corn from stalks on the right and left, twisting each ear from the stalk and tossing it into a the bang board on the wagon pulled by his Dad’s horses,” Edmunds explained. Revealing evidence of its long life, the faded green box wagon is now owned by Bruce and his wife, Dorothy, but it originally belonged to Dorothy’s grandfather, and then her dad. Owned by Edmunds, who has a collection of old time machinery on his Lyon County farm, the corn sled was explained while Edmunds demonstrated its operation as he was seated on the horse drawn antique machine. “The platform on runners has an angled blade, and when pulled close enough along a row of corn slices through the stalks a few inches above ground level. With the help of a curved gathering arm, the cut stalks are gathered and then thrown in the outside row for assistants to set and up and tie into the shock,” explained Edmunds, clarifying that some of his terms might not be known to the lay spectators. 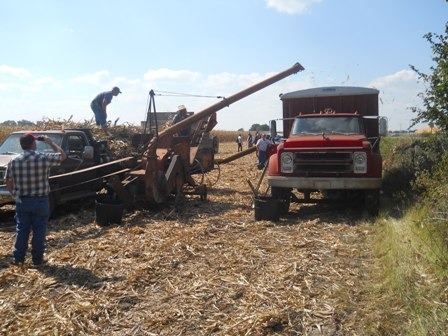 Kirby Zimmerman had one of the antique tractors from the Ag Heritage Park hooked to a one-row corn binder, from the unique old machinery collection, and proficiently demonstrated how corn stalks are cut and accumulated into bundles. “The bundles are then put into shocks for winter feeding to livestock, or the bundles can be thrown into a corn sheller to separate grain from the cob and stalks,” Edmunds explained. Another antique John Deere tractor was “belted up” to the nearby old corn sheller as bundles were tossed aboard by volunteers, as big yellow corn kernels flowed abundantly into the grain truck at field side. A horse powered sweep grain grinder was hitched to Anderson’s Minnie who walked diligently round and round as the deep yellow kernels were turned into ground corn for livestock feed. One-row tractor powered corn pickers and additional farm machinery used in corn harvest in the early part of the 20th century were demonstrated by the enthusiastic event hosts and knowledgeable cooperative assistants. Ralph Anderson, now long retired from off-farm, non-horse power employment, was behind a workhorse team before he could walk as he rode along with his dad Oscar Anderson. Horsepower was still an important part of farming operations when Ralph Anderson was growing up, although the family did have a small tractor for use on their Morris County farm north of Council Grove. “Dad bought an Allis Chalmers tractors new in 1935, so we had a tractor before some of the neighbors. But, we still used horses a lot, and I started driving a team, sitting with Dad in the implement seat when I was quite young,” Anderson fondly remembered. “One day when I was just seven, nobody was around, and I harnessed a horse all by myself, hitched him to the mower, and was mowing weeds in the yard when Dad got home. First thing he said was, ‘we don’t need those weeds in the yard cut. If you’re going to mow, clean up the weeds around that corn field, so it looks better,’” Anderson smiled in reflection. But, horses and horsepower have remained important throughout Ralph Anderson’s life. Always involved in farming to an extent, Anderson had off-farm jobs until retirement age. “Dad worked at a factory in town for more than 20 years and was having health issues, but when he got his horse teams again and started working with them, he became completely healthy. You can’t find many men his age as active a Dad is these days,” credited son Bruce. Involved in his own small farming operations and handling custom hay services, Ralph Anderson hooks his draft teams on a regular basis for farm work, community demonstrations such as this one, a number of parades and just giving public rides for city folks. Another full blood Belgian mare called Maude is 13-years-old and is used by Anderson in his operations as well. All of the training on his horses has been done personally by Anderson. “I started driving the main team when they were weanlings and yearlings, had them hitched the first time at 22-months of age. They’ve just taken to this completely naturally,” explained Anderson, who has a preference for mares over geldings. “They seem to be more ready to work for me, not that there’s anything wrong with geldings, but I think mares have more try and heart for what I want,” Anderson evaluated. “We’ve plowed, disked, planted, cultivated, picked corn, powered the grain grinder, mowed hay and weeds, and been in hundreds of parades. You about name what can be done with a draft horse team, and we’ve done it,” Anderson contended. A horse trolley is among many of the horse drawn vehicles and machinery in his personal collection, and it works well for community tours and family outings which Anderson is frequently called to help with. A hotel hack is owned by the city of Council Grove, and Anderson generally is called upon to have his team pull it several times during the Christmas season for starlight tours of the historical community. History, and keeping ways of the past alive and memorable to today’s and future generations, is important to Anderson, who has undertaken major responsibility for the nearly 150-year-old native stone barn owned by Morris County, and located a short distance east of Council Grove on “56,” just north of the highway. “We’ve done lots of renovation on this beautiful barn, but there’s still plenty to do, just like all of the old historic facilities around, even like the Heritage Park here in Alta Vista,” Anderson commented. An antique John Deere tractor was “belted up” to an old corn sheller as bundles were tossed aboard by volunteers, and big yellow corn kernels flowed abundantly into the grain truck at field side during old time farming demonstrations organized Saturday by Ag Heritage Park of Alta Vista. When gasoline got to $4 a gallon, Anderson often let his tractor set idle. “I do custom haying, and when the grass would need turned, I used my team a lot of the time. It took longer, but I made more money in the end,” he insisted.“It’s good to keep these buildings and all of the historical items of our forefathers, but upkeep is a major expense and sometimes a fulltime job,” he added emphatically. Bruce Anderson has diversified cropping and livestock operations on his Lyon County farm, but horsepower is still often called into work, too. “I grow about all crops, and often use my horses to reduce my machinery expense. My costs are relatively low compared to some of my neighbors, and the higher grain prices of recent have been good for my profit margins,” explained the younger Anderson, who has black draft mares and a team of full blood Percheron geldings used in his working teams. “While the recent downtrend in cash grain markets has some big farmers concerned about returns this harvest, I’m going to feed my crops to my cattle. More pounds make more dollars as the heavier cattle are selling high, too,” Bruce pointed out. Although Bruce and Lester didn’t have their teams at the Alta Vista demonstration, they have had them at similar events. Lester Edmunds had his horses powering a stationary baler for a demonstration earlier in the month at the High Ground Museum near Council Grove. 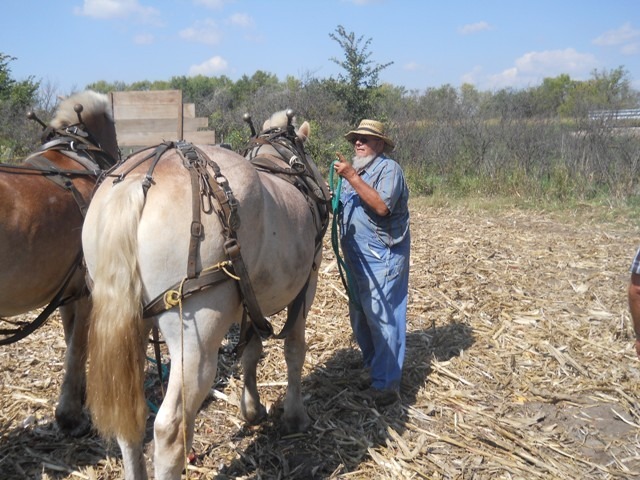 Bruce Anderson coordinates draft horse farming demonstrations during Yoder Days in the Reno County Amish community. 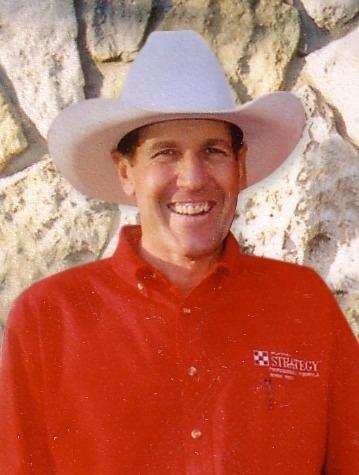 As a member of the Kansas Draft Horse Association, Bruce Anderson has assisted with the large annual Draft Horse Show at the Kansas State Fair. He was working at the entrance gate throughout the show this year. Horse power is far from dead and gone, and with rising overhead could become more prominent again, according to Ralph and Bruce Anderson and Lester Edmunds, and his son Randy. The younger Edmunds doesn’t have any teams today, but assists his dad, and was at ringside watching the demonstrations and expressing importance of horse power in the past and potentially in days ahead. While Saturday’s event was a demonstration, corn husking is a major competition in many communities. Unrecorded husking contests took place on many farms when the boss would challenge his hired-man to see who could get to the end of the field before the other. Occasionally, farmer-neighbors would declare over the fence: “I’ll race you to the other end,” and the race would be on. These friendly jousts helped to take some of the tedium out of the wrist-hurting, back-tiring and arm-frazzling job of harvesting the farmers’ biggest cash crop: corn. 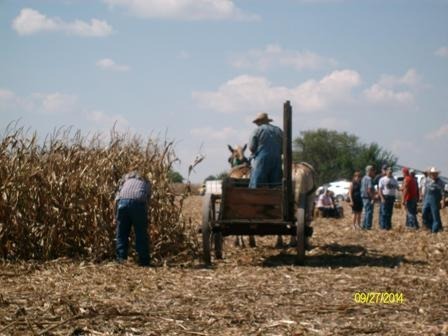 “The primary object of the organized corn husking contest was to see who could husk the most ear-corn in a given time, from standing rows and thrown into a wagon, with each load subject to deductions,” Bruce Anderson noted. A proficient corn husker, Bruce Anderson placed first place in the novice division of the North Central Kansas Corn Husking Contest at Courtland in 1982. He also placed high in several other husking competitions through the 1980s and into the 1990s, but no longer participates in the contests. Although a number of corn husking contests are scheduled throughout the Midwest, the Kansas State Corn Husking Contest is at Oakley on October 11. The National Corn Husking Contest is in Amana, Iowa, October 19. Even though the Armistice ending the Great War had gone into effect in November 1918, the wartime boom continued through 1919. Many soldiers were still on occupation duty and had not yet been demobilized. “This meant that farm labor was in short supply and wages were high, explaining how a man who was a good corn cutter could earn the princely sum of $15 or $20 a day. The pay in 1919 may have been good, but cutting corn by hand was still slow, hard work. A man with a corn knife was fortunate if he could cut and shock an acre and a half per day,” one historical review reported. Several of those attending the Ag Heritage Park reminisced stories heard from forefathers of corn husking days bygone. “One farmer said he’d get up at four o’clock, shuck a wagon load of corn, milk the cows, scoop the corn off the wagon, have dinner, shuck another load of corn, milk the cows again, and scoop the load of corn off before supper. That made for a long day,” Swartz commented. It was a different time, for sure.